#stampinup #faithfulinkspirations #OnStageTelford2019 Oh my goodness! I have been so neglectful of my blog this year. I've been knitting traveling lazy in a creative funk. Does that ever happen to you? Well, I got recharged at Stampin' Up's OnStage event in Telford, England! Yes, England! I was on a business trip in England in the early part of April, so I stayed a couple extra days to attend the Telford OnStage event with my British stampin' pals! It was so much fun and I came away with lots of inspiration. And lots of goodies! Look at all the fab new Stampin' Up products and the gifts I got from Mikaela Titheridge and her team the Stampin' Stylettes!! At OnStage we got to see the new Stampin' Up catalog--which you are going to LOVE!--and we got to play with new products from the catalog. Yay! Over the next few weeks, I'm going to be showing some of the new products and I'll be showing some retiring products as well. If there's something in the current catalog that you want, make sure to get it before supplies run out--or before the new catalog price increase. Now would be a good time to stock up on inks and card stock, too. 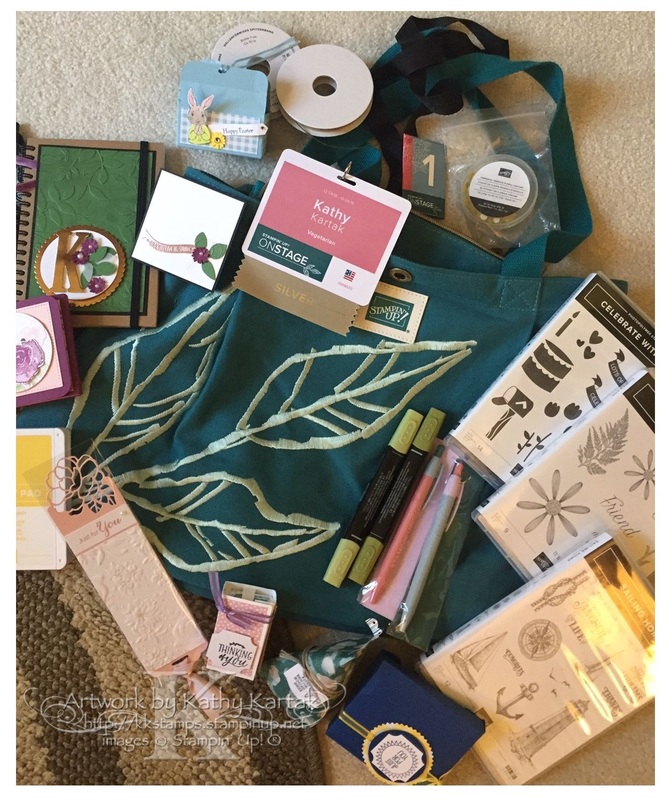 Since I was traveling before the OnStage event, I couldn't carry a whole lot of stampin' stuff with me, so I only signed up for one organized swap which was for fancy cards. Oh my gosh! I got some incredible cards in that swap. I'll be showing them in the next few weeks, too. But how about taking a look at my fancy swap card? All of the products (except one) are carrying over to the new catalog! I stamped the main image from the "Country Home" stamp set in Tuxedo Memento Black Ink onto a Whisper White panel that I cut with one of the Stitched Rectangles Dies. I colored the image with Light and Dark Smoky Slate, Light and Dark Old Olive, Light and Dark Daffodil Delight, Light and Dark Crumb Cake, and Dark Cherry Cobbler Stampin' Blends. I colored the cotton with Clear Wink of Stella. Finally, I stamped the "simply thankful" sentiment in Cherry Cobbler Ink onto a Whisper White scrap and used my Paper Snips to fussy cut the image. I adhered this to the card with a combination of regular and Mini Stampin' Dimensionals. Come back tomorrow for a sneak peek at something that Stampin' Up rarely gives us an insight into! !